The Body Shop has launched Chocomania, a new personal fragrance to match the popular bath & body products of the same name. Can’t get enough of your favourite Chocomania scent? Indulge your senses with the decadent, deliciously chocolatey scent of Chocomania Eau de Toilette. Our Community Fair Trade organic cane sugar comes from Paraguay. The Montillo co-operative hand-harvest the cane and grind it to release the juice, which is turned into crystallised sugar. Trade provides a regular income to over 160 farmers. Unlike commercial sugarcane plantations that use ‘slash and burn’ techniques, organic production helps to protect the environment. 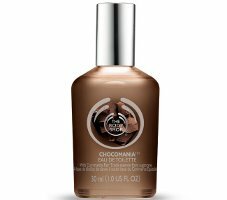 The Body Shop Chocomania is available in 30 ml Eau de Toilette. I was in The Body Shop yesterday — I didn’t see this EDT, so perhaps it hasn’t made it to the States, yet? I did get the shower gel for free — they were having an in-store deal where you pull coupons from a basket. Anyone interested in this scent should also consider the Chocomania body oil. The scent is so strong I actually can’t wear it. There is a note in it that I just can’t cope with for an extended period. The body oils, however, are very nice – I’v been thinking of getting the more subtle shea one for about a year now, lol! If anyone can compare Montale’s Chocolate Greedy for me, I would appreciate it! I am looking for a chocolate fix — I got a sample of Xocoatl by Fueguia 1833 (notes: vanilla, rum, and cocoa) from Lucky Scent. I’ve tried it once, but I’m not getting much chocolate — it starts off a bit fruity, then goes straight to what I assume is rum (I’ve never tasted rum). Ooooo … I think that my next round of samples from Lucky Scent should be all chocolate scents — Montale Chocolate Greedy, Serendipitous (I think that is was gone for a while? ), Piment Brulant, etc.). I want to try Anima Dulcis, too! Anima Dulcis definitely sounds good. I do quite like Pure Havane which initially seemed more chocolate than tobacco to me, but now that I am particularly looking for chocolate it smells much more strongly of tobacco, lol! I haven’t tried the others you mention – but they all sound very nice. I’m a little worried about chocolate heavy scents because as well as the Body Shop oil I also once had a Crabtree&Evelyn Orange and Chocolate lotion and was unable to use that as well. Congrats, that’s a nice freebie! I wear The Body Shop Coconut fragrance, being a mad coconut fanatic. I also liked their Grapefruit one for Summer. I’m thinking the Chocomania and Coconut mixed together may create a sweet and exotic scent?